My team for a variety of reasons, unfortunately was not open to changing our essential questions, so this year I approached the unit differently. What was most wonderful was that I didn’t have to create the challenge based learning experience, my students did! Here’s how this year the unit has unfolded differently than in previous years. This year after visiting the local landfill, in one of my guided reading groups, we read this NEWSELA article “Is it possible to make no waste?” This group had further questions so we watched this video about a family working toward zero waste. They were quite excited and wanted to share what they had learned with our class. They asked their classmates “How much waste do you think we produce in a week?” and “Could we try a zero waste challenge?” The class responded yes so we began tracking our classroom waste for a week. As you can see, each day our learning evolved as the students noticed symbols on their snack items, shared about composting and asked further questions. The week before spring break we tracked our classroom waste using a graph and compared the amount of waste to the earlier photos from above. 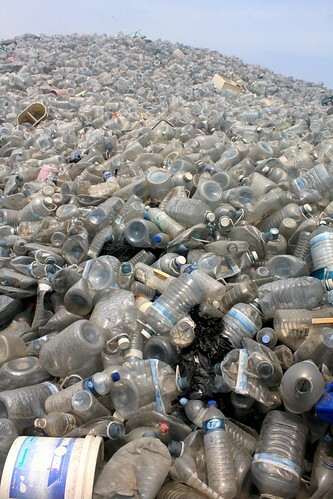 We have about 50% less plastic waste than we did previously. So, even though our essential question wasn’t changed nor official in how we measured success, it’s shifted the children’s thinking. We additionally had a recent alumna, Erika, visit school about how she is working toward zero waste living in Prague. Her visit and making our classroom waste tangible in tandem with providing students greater choice in how they took action (which I discussed more in my previous post) inspired students that they could make an impact. We are wrapping up the taking action phase of our unit and at our Friday elementary school assembly, my class was able to celebrate successes with helping to ban plastic straws from the school cafeteria. Also, one of my students wanted to ask for others’ help with the playground litter problem. What’s amazing to me is that a second grade teacher emailed me, less than 3 hours after the assembly, sharing two videos created by 8 students in her class on the day before spring break began. Wow! These two groups of students had spent their recess also cleaning up the playground and created a schedule so they could help my student with his efforts. One next step is that as the students begin to create their final products to share their action story (a digital book, iMovie or scrapbook), I need to develop a multimedia rubric to help enhance their products and build in a scope and sequence for media products in grade 3. The use of Challenge Based Learning has had greater impact on students’ learning, engagement and responsibility than even before. When I reviewed the Challenge Based Learning framework, I realize there is greater work to be done which revamping this unit. This year’s improvement sent me back to rereading about Challenge Based Learning(CBL). I found the CBL report quite helpful in understanding why this year’s student engagement and level of individual responsibility has increased. The below image shows a summary of the results from 321 students and 29 teachers participating in a CBL experience. One area in particular that I see a similarly in my own class’ results to the CBL report is related to the increase of the 21st century skills students were required to use throughout this unit of inquiry. While reading Stephen Noonoo’s post about the differences between PBL, CBL and other -bl approaches, it made me, as my colleagues and I chat informally, wonder could we have a book study next year about taking action and read the Challenge Based Learning Guide? It made me wonder about coordinating our efforts. About organizing ourselves more meaningfully so we aren’t working in silos and students experiencing CBL or PBL experiences in isolation without a set of skills without a sequence to them. Also, with an entirely new grade level team next year, I see another opportunity to revamp this unit of inquiry using a Challenge Based Learning approach by revamping our essential questions and perhaps put an emphasis on working collaboratively (a skill not currently emphasized during this unit). Have you used CBL? Does your school have a scope and sequence to teaching 21st century skills?